Visual field loss in bitemporal hemianopsia: compression of the optic chiasm leads to a characteristic pattern of vision loss affecting the outer halves of each eye. 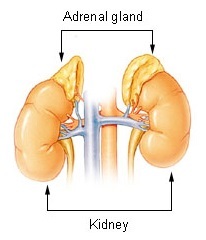 The adrenal glands, located above the kidneys, are typically the first to be affected in pituitary apoplexy. When the stimulating hormone ACTH is not secreted, the adrenals cease to produce cortisol. Normal pituitary gland on MRI (T1 sagittal without contrast enhancement). The arrow points at the posterior pituitary (intense signal), and the arrowhead at the anterior pituitary. ^ a b c d e f g h i j k l m n o p q r s t u v w x y z aa ab ac ad ae af Rajasekaran S, Vanderpump M, Baldeweg S, et al. (Jan 2011). "UK guidelines for the management of pituitary apoplexy". Clin Endocrinol. 74 (1): 9–20. doi: 10.1111/j.1365-2265.2010.03913.x. PMID 21044119. ^ a b c d e f g h i j k l m n o p q r Murad-Kejbou S, Eggenberger E (Nov 2009). "Pituitary apoplexy: evaluation, management, and prognosis". Current Opinion in Ophthalmology. 20 (6): 456–61. doi: 10.1097/ICU.0b013e3283319061. PMID 19809320. ^ a b c Melmed S, Jameson JL (2005). "Disorders of the anterior pituitary and hypothalamus". In Kasper DL, Braunwald E, Fauci AS, et al. (eds.). Harrison's Principles of Internal Medicine (16th ed.). New York, NY: McGraw-Hill. pp. 2076–97. ISBN 978-0-07-139140-5. ^ a b c d e f g h i j k l m n o p q r s t u v Nawar RN, AbdelMannan D, Selman WR, Arafah BM (Mar–Apr 2008). "Pituitary tumor apoplexy: a review". J. Intens. Care Med. 23 (2): 75–90. doi: 10.1177/0885066607312992. PMID 18372348. ^ Bruce BB, Biousse V, Newman NJ (Jul 2007). "Third nerve palsies". Semin Neurol. 27 (3): 257–68. doi: 10.1055/s-2007-979681. PMID 17577867. ^ a b c d e de Herder WW, van der Lely AJ (May 2003). "Addisonian crisis and relative adrenal failure". Rev Endocr Metab Disord. 4 (2): 143–7. doi: 10.1023/A:1022938019091. PMID 12766542. ^ Fernández-Balsells MM, Murad MH, Barwise A, et al. (April 2011). "Natural history of nonfunctioning pituitary adenomas and incidentalomas: a systematic review and metaanalysis". J. Clin. Endocrinol. Metab. 96 (4): 905–12. doi: 10.1210/jc.2010-1054. PMID 21474687. ^ a b c Russell SJ, Miller K (2008). "Pituitary apoplexy". In Swearingen B, Biller BM (eds.). Diagnosis and management of pituitary disorders. Totowa, NJ: Humana Press. p. 368. ISBN 978-1-58829-922-2. ^ Thorner MO, Vance ML, Horvath E, Kovacs K (1992). "The anterior pituitary". In Wilson JD, Foster DW (eds.). Williams Textbook of Endocrinology, 8th edition. Philadelphia: W.B. Saunders. pp. 294–5. ISBN 978-0-7216-9514-3. ^ Post KD, Shiau JS, Walsh J (2008). "Pituitary apoplexy". In Loftus CM (ed.). Neurosurgical Emergencies (2nd ed.). New York, NY: Thieme Publishing Group. pp. 78–83. ISBN 978-3-13-135052-7. ^ a b Adams CB (2003). "The surgery of pituitary tumours". In Wass JA, Shalet SM (eds.). Oxford Textbook of Endocrinology and Diabetes. Oxford: Oxford University Press. pp. 161–2. ISBN 978-0-19-263045-2. ^ van Aken MO, Lamberts SW (2005). "Diagnosis and treatment of hypopituitarism: an update". Pituitary. 8 (3–4): 183–91. doi: 10.1007/s11102-006-6039-z. PMID 16508719. ^ Jane JA Jr; Vance ML; Laws ER (2006). "Neurogenic diabetes insipidus". Pituitary. 9 (4): 327–9. doi: 10.1007/s11102-006-0414-7. PMID 17080264. ^ a b Russell SJ, Miller K (2008). "Pituitary apoplexy". In Swearingen B, Biller BM (eds.). Diagnosis and management of pituitary disorders. Totowa, NJ: Humana Press. p. 356. ISBN 978-1-58829-922-2. ^ Bailey P (1898). "Pathological report of a case of akromegaly, with special reference to the lesions in the hypophysis cerebri and in the thyroid gland; and a case of haemorrhage into the pituitary". Phila Med J. 1: 789–92. ^ a b Russell SJ, Klahr Miller K (2008). "Pituitary apoplexy". In Swearingen B, Biller BM (eds.). Diagnosis and management of pituitary disorders. Totowa, NJ: Humana Press. p. 354. ISBN 978-1-58829-922-2. ^ Bleibtreu L (1905). "Ein Fall von Akromegalia (Zerstorung der Hypophysis durch Blutung)". Munch Med Wochenschr (in German). 41: 2079–80. ^ Dott NM, Bailey P, Cushing H (1925). "A consideration of the hypophyseal adenomata". Br J Surg. 13 (50): 314–66. doi: 10.1002/bjs.1800135009. ^ a b Brougham M, Heusner AP, Adams RD (Sep 1950). "Acute degenerative changes in adenomas of the pituitary body--with special reference to pituitary apoplexy". J Neurosurg. 7 (5): 421–39. doi: 10.3171/jns.1950.7.5.0421. PMID 14774761.